Much like childproofing our homes, we can cat-proof our house or apartment. Evaluate the potential health hazards. Are there places you don’t want your cat to go? Are there disasters waiting to happen? Use these simple suggestions to think differently about how your household is set up. Sometimes these things involve thinking outside the box, but trust me, your cat will thank you after she narrowly avoids disaster. Cats are good at jumping out of the way quickly, but they might not have a chance, for example, if a top-heavy bookcase decides to suddenly tip over. Check your place: Are there piles of things that could suddenly topple and hurt a cat who happened to be in the wrong place at the wrong time? Even stranger (but true — it happened at our house) are cabinets that may come loose and crash to the ground if installed improperly. So case out your place and look for these possibilities, then fix them. If you have cabinets, shelves, or other places where cats are constantly jumping, make sure these places are strongly secured and strong enough to hold the weight of your cat and whatever is stored within them. Cat lovers know that cats are fascinated by motion. We also know that cats will take off running very quickly, with no warning. I have a small house. I’ve had some close calls with exercise equipment. (Ideally, I’d have a workout room that was separate and off-limits to the cats.) An elliptical machine, for example, could really be a problem for a cat if a person is using it and a cat happened to run under it or in front of it. Similar things can happen with a treadmill. Even free weights can be dangerous in a small space. If you have large pieces of equipment, be very vigilant. Put the cats in another room when you’re using them, or stay alert. If you don’t want your cats going outside, make sure doors and windows shut securely. 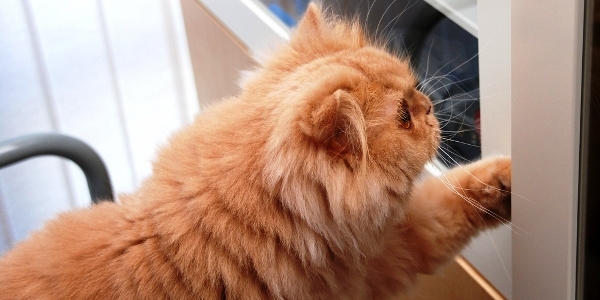 Use tough screening in your windows, so a cat can’t accidentally rip through the screen and escape. Also, look for places in the house where you don’t want your cats to be. 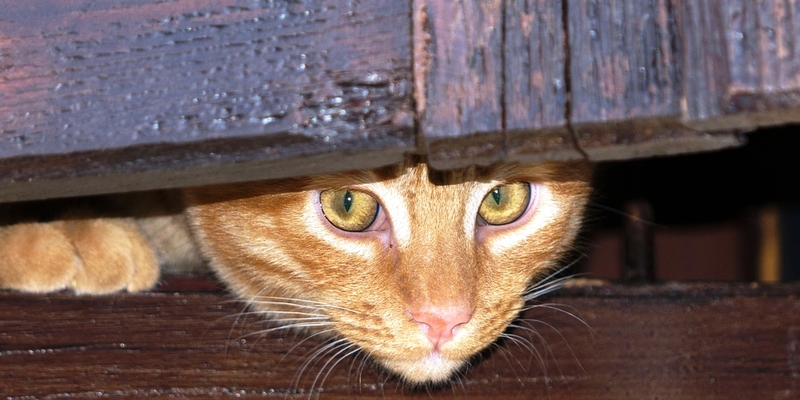 If you don’t want your cat under the sink sniffing the jar of cleanser or other cleaning materials, make sure those cabinet doors shut securely or buy childproof latches that can be installed on the inside of cabinet doors. All the usual culprits apply here, and maybe some you haven’t even thought of. Keep anything off-limits that might attract or harm your cat. Think string-like things (rubber bands, yarn, dental floss, kitchen twine, sewing thread, needles). Put away toys like the Feline Fisher (which my cats love but which has a long string) when not in use. Also, know your cat. I have one friend who had a cat who would ingest fuzz off the floor. It’s probably pretty hard to keep up with such a cat, but the cat could get in trouble if he ingested enough dryer fuzz or other bits of stuff. So know your cat’s obsessions and try to work around them. (My friend vacuumed a lot.) Anything a cat can swallow should be suspect. Older and special-needs cats can get into all kinds of trouble, and you may need to modify their environment to make it safer for them. If your older cat craves to be on the bed and can no longer make the jump, provide some sort of sturdy stepping stool. 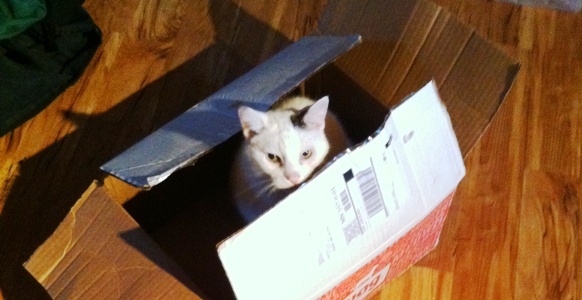 If your cat has trouble climbing in and out of the litter box, perhaps a box with a lower side (or a dip in one edge) will help her enter and exit more easily. If your cat has trouble walking, a smooth floor may present problems. Every situation will be different, depending upon your cats. 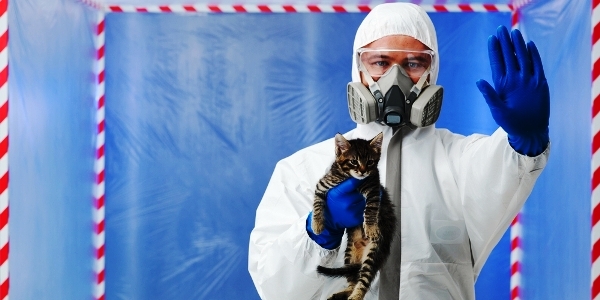 There are many things we can do to make our homes safe for our cats. What are your suggestions? Share your thoughts in comments!